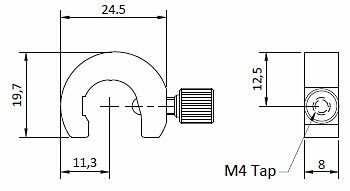 PC – 12 Post collars are slip on type collars with M4 soft metal tipped knob. PC – 12 collars are made of aluminium B51S alloy metal with black anodized finish. PC – 12 post collars are suitable for our 12 mm diameter posts. They can be easily inserted or removed by using suitable access slots provided.